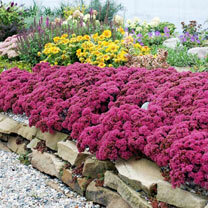 Part of a new range (recently bred in America) of low growing and spreading sedums with interesting foliage and knockout flower power. The glorious deep pink flowers of Dazzle Berry complement the light grey foliage producing a lovely mound of colour from mid summer. Flowers July-October. Height 10-20cm (4-8"); spread 40-50cm (16-20"). Supplied in a 2 litre pot. Ideal for beds and borders, patio pots and containers, rockeries. Attractive to butterflies and bees. Drought resistant. Prefers full sun or partial shade.